Psychoanalysis has transformed our culture. We constantly use and refer to ideas from psychoanalysis, often unconsciously. Psychology, philosophy, politics, sociology, women's studies, anthropology, literary studies, cultural studies, and other disciplines have been permeated by the competing schools of psychoanalysis. But what of psychoanalysis itself? Where is it going one hundred years after Freud's own speculations took shape? Does it still have a role to play in cultural debate, or should it perhaps be abandoned? 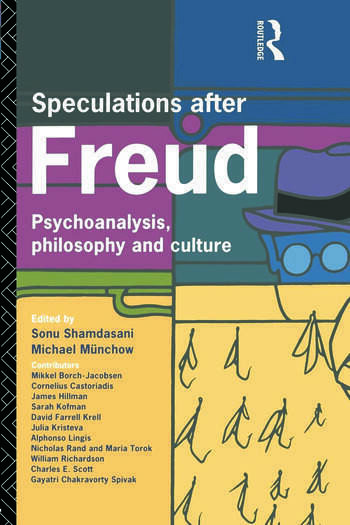 Speculations After Freud confronts the dilemmas of contemporary psychoanalysis by bringing together some of the most influential and best known writers on psychoanalysis, philosophy and culture. The advocates and critics of psychoanalysis, both institutional and theoretical, critically appraise the powerful role psychoanalytic speculation plays in all areas of culture.